Are hospitals emerging as the champions of social networking? What organisation can do without social networking these days? It is now impossible to talk about digital transformation without having a social media presence. Hospitals have grasped this very well, and have fully immersed themselves in the conversation: in 2014, 69% of public hospitals were on Facebook. To enhance their reputations, keep their patients informed, or even to create new relationships with patients, there are more reasons for healthcare establishments to be on social networks than there are reasons for them not to be, even though this requires constant vigilance to balance freedom of expression with the need to ensure medical confidentiality. 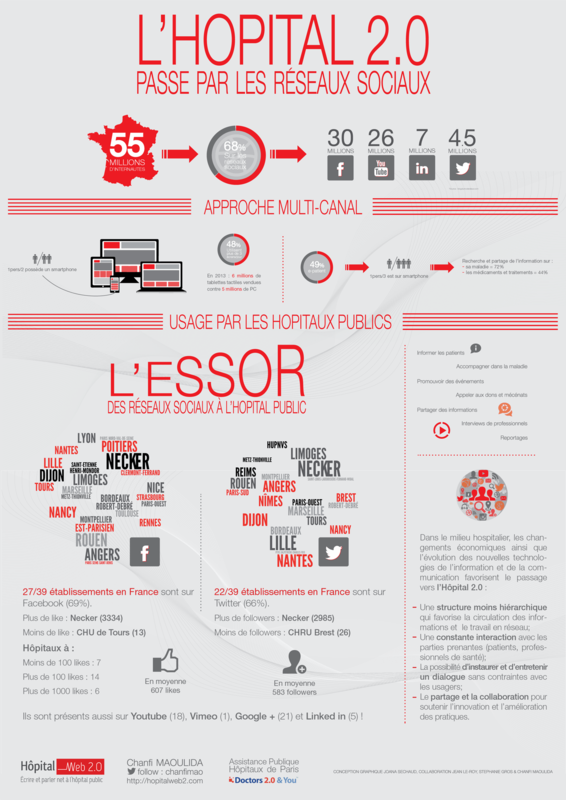 66% of public hospitals in France are on Twitter. The content they disseminate is aimed mainly at journalists on the one hand and, on the other, the scientific community – both in France and internationally – which is very active on this network. The Necker Enfants Malades children’s hospital in Paris has 9,500 friends on Facebook and Rouen CHU university hospital has more than 5,000, Robert-Debré hospital in Paris 4,270, and so it goes on. Hospitals have not missed the boat where social networking is concerned: more than two thirds of them are on Facebook1, the most popular network by virtue of its general public reach - in France, 30 million people have a Facebook account (see sidebar: Hospitals on Twitter). Some CHUs have even started to champion the running of online communities, using their pages to inspire people to engage and share, painting a more modern, less unnerving image of hospitals. The importance of brand image for a hospital is far from insignificant in a sector that is not immune from the principles of competition, especially between public hospitals and private clinics. Hence the need for hospitals to highlight their “good deeds”. “As the public cannot necessarily imagine what goes on in a hospital, it is important to know how to tell them”, points out Yves Cottret, Executive Director of the MACSF Foundation2, who sees Facebook and Twitter as tools to promote and boost the profile of hospitals both for the general public and internal staff. “Some teams do not realise that they are doing remarkable things. Their successes need to be highlighted so as to inspire others and encourage hospitals to share their experiences,” Mr Cottret continues. Nevertheless, social networking involves a minimum level of investment for these establishments: the recruitment or training of a community manager, the generation of content, the involvement of professionals from within the hospital, etc. Consequently, those CHUs and large hospitals with internal communications teams were the first to get on board, whilst many more have still not taken the plunge: “only around two thirds of the 32 university hospitals (CHUs) and around 50 of the 500 local hospitals (CHs) in France are on social networks”, Yves Cottret estimates. For Rouen CHU, the hospital’s reputation was far from the main priority when it set up its Facebook page 4 years ago. “We wanted to create a closer relationship with our patients, and to foster dialogue with them. Facebook enables us to communicate in a conversational way that we didn’t have with our more conventional methods – hospital TV, website, leaflets, etc. – which disseminate information in a top-down way,” Remy Heym explains. And so the hospital trained a community manager who works almost full-time on generating this conversation, through TV broadcasts presented by the doctors themselves, reports on what’s happening behind the scenes at the CHU and calls for questions on public health issues such as diabetes, prostate cancer, etc. “Keeping patients informed and disease prevention are now components of care, and hospitals, as care institutions, have a duty to provide the best solutions. Amongst our medical staff, we have leading professors of international renown, and they are now able to respond directly to the general public on Facebook - that’s a real plus,” Remy Heym is pleased to point out. Although it’s possible to talk to an oncology bigwig on Facebook, there is absolutely no question at all of turning the social network into an instrument for medical consultation. It’s actually not unusual for patients to attempt to talk about their own individual cases on the hospital’s Facebook page. “If they do, we provide a generic response, it is the role of the community manager to know how to moderate the discussion,” adds Remy Heym. This uninhibited dialogue between the hospital and the general public, doctors and patients, also tends to make some people forget that Facebook is a public forum where confidentiality, medical secrecy and patients’ rights must be observed. It is precisely to avoid this kind of drift that the MACSF Foundation has produced two guides3 on appropriate use of social networks by hospitals. “Anyone coming into a hospital, whether as a patient, family member, visitor or delivery person – or anyone working there – could potentially post something inappropriate on a social network, with serious consequences for the hospital’s reputation and practices, for its duty of confidentiality or medical secrecy,” explains Yves Cottret. For example, the mere fact of confirming that someone is in hospital is, in itself, a breach of confidentiality. The Foundation has, therefore, set up guidance workshops for management teams, hospital executives and nurses in order to disseminate the rules they should observe on social networks. They include a reminder of the obligations already enshrined in the regulations and collective agreements that cover healthcare professionals, “but social networks are so much part of our lives that the boundaries are blurred at times, even in hospital”, states Yves Cottret, who calls for care when taking photos in hospitals. So when are we going to see “photos and selfies prohibited” signs in the corridors of our CHUs?